Adverse childhood experiences (ACEs) have deleterious effects on health across the lifespan. Educating health professionals for ACEs awareness and prevention facilitates quality care. Literature documents concept mapping as an effective teaching strategy used in health professions to stimulate learning and foster students' critical thinking. However, ACEs curricular concept mapping remains unexplored. Content analysis with manifest coding was used to identify key concepts based on faculty narratives and discussion notes about ACEs content. Major and minor themes emerged to support the ACEs Curricular Concept Map development with direct and indirect paths to culture of health and health equity. Approximately 20 years ago, the Adverse Childhood Experiences study reported a link between traumatic events in childhood and development of chronic health problems in adulthood (Felitti et al., 1998). Health professions, including nursing, ought to play a key role including ACEs education across the curricula to prepare future health care providers. Integration of ACEs across nursing curriculum enables faculty to prepare students with essential ACEs knowledge and evidence-based practice skills (Gill, Zhan, Rosenberg, & Breckenridge, 2019). To do so, an ACEs curricular concept map needs to be developed to guide faculty teaching ACEs across Bachelor of Science in Nursing (BSN) curriculum in both didactic and clinical settings. The purpose of this qualitative study is to describe the development of an ACEs Curricular Concept map to guide teaching in a BSN program. Rooted in the learning movement called constructivism, concept maps link prior knowledge to construct new knowledge (Kafi & Resnik, 1996). A concept map visually organizes important ideas to illustrate relationships among concepts in effort to promote students' knowledge comprehension, skills development, and critical thinking engagement for purposeful decision making (Akcay, 2017; Cantinotti, Desormeaux-Moreau, & Balbinotti, 2017; Novak, 2013; Wei & Yue, 2017). Concept mapping has been used as effective teaching and learning strategies in higher education (Daley, Beman, Morgan, Kennedy, & Sheriff, 2017; Novak, 1990, 2003, 2006) and is especially useful in science curriculum development to foster students' understanding of science content without reliance on rote memory (Akcay, 2017; McDaniel, Roth, & Miller, 2005). Health professionals in medicine, medical informatics, medical education, physiotherapy, psychotherapy, public health, speech pathology, and nursing have used concept mapping as a teaching strategy. Medical education has used concept maps for teaching students about pathophysiology, differential diagnosis, disease processes, and assessment tools for problem-based and collaborative learning (Torre, Durning, & Daley, 2013). In a qualitative study, third-year medical students (n = 134) reported that concept mapping helped them “think like a physician” in clinical settings (Torre et al., 2007). Results from a comparison study showed that medical students who were introduced to concept maps scored significantly higher in mid-term and final examinations, compared with students who did not use concept maps (Joshi & Vyas, 2018). Dattilo, Gagliardi, and Holmer (2017) found concept mapping to be a useful tool for physician residents to teach medical students about clinically pertinent lessons during their rotation in psychiatric medicine, and more than 90% of medical students (n = 17) expressed improved satisfaction with their learning experiences during the clinical rotation. Bala, Dhasmana, Kalra, Kohi, and Sharma (2016) found second-year medical students' examination scores in the pharmacotherapy of HIV/AIDS were significantly higher after integrating concept mapping with lecture delivery methods. In a quasi-experimental study, researchers found that concept mapping fosters students' clinical reasoning skills in physiotherapy, in which advanced and novice physiotherapy students completed concept maps performed better in selecting electro-therapeutic currents to treat patients with motor-neurological deficiency than those students without completion of concept maps (Montpetit-Tourangeau et al., 2017). Other authors noted that undergraduate physiotherapy students using concept maps improved their understanding of concepts related to impairments due to cerebrovascular accident (Joseph, Conradsson, Nilsson Wikmar, & Rowe, 2017). Psychotherapists have used concept mapping to teach novice therapists how to collect, organize, synthesize, and interpret client information (Liese & Esterline, 2015). Concept mapping paired with expert supervision potentiates general psychotherapy skills in professional development among new therapists (Liese & Esterline, 2015). Furthermore, public health professionals have used concept mapping to address challenges common to public health practices. Concept mapping provided a visual plan to generate ideas for program development and priority actions on several published public health projects (Anderson & Slonim, 2017). In an exploratory review article of 12 studies, concept mapping guided evidence building to promote improved decisions in public health practices in all but one study (van Bon-Martens, van de Goor, & van Oers, 2017). In a longitudinal study, researchers developed and implemented a Concept Map Assessment Profile (CMAP) instrument to measure students' critical thinking performance during a 4-year speech–language pathology undergraduate education program and found that students who used concept maps had increased CMAP scores that reflected improved critical thinking performance (Mok, Whitehill, & Dodd, 2014). Nursing has used concept mapping to prepare students for development of care plans relevant to specific patient needs (Schuster, 2012). Several studies reported that concept mapping improved students' critical thinking. A quasi-experimental study noted significant improvement in critical thinking skills among the fourth-year nursing students who received concept map training to develop nursing care plans (Nirmala & Shakuntala, 2011). A systematic review and meta-analysis found that concept mapping improved first- and second-year nursing students' critical thinking skills (Yue, Zhang, Zhang, & Jin, 2017), improved students' examination scores for academic achievement, and increased students' ability to translate theory to clinical practice (Daley, Morgan, & Beman, 2016). A quasi-experimental study revealed that students who constructed concept maps scored higher on cumulative tests in both fundamental and medical–surgical courses than students who took only traditional multiple choice quizzes in these courses (Jaafarpour, Aazami, & Mozafari, 2016). Nursing students who developed three-dimensional concept maps were motivated to learn about pain management and caring processes for patients postcholecystectomy (Chan, 2017). In a pilot study with mixed-methods, BSN students using concept maps improved their clinical understanding of mental health nursing contents taught in the classroom (Bressington, Wong, Lam, & Chien, 2018). Moreover, using concept mapping, undergraduate nursing students increased their clinical reasoning skills and independent learning about oncology and related diagnoses (Trevisani et al., 2016). The visual appeal of concept maps allowed students to take note of information they do not understand. Similar to a parking lot, students can “park” unknown and undecided information within the concept map for clinical discussion with faculty or members of the health care team to exchange views about fittingness of the concepts (Schuster, 2012). However, evidence is limited on the effect of concept mapping on clinical learning during postclinical conference debriefing. Using concept maps in simulation generates new interests in nursing education. In a pilot study using concept maps to prepare fourth-year nursing students for high-fidelity simulation, students reported that concept maps helped them recall pertinent information from previous courses and increased their understanding of complex disease processes by linking knowledge from classroom to clinical experiences (Daley et al., 2017). Among nursing students who developed concept maps prior to simulation, experiences demonstrated improvement in grasp of the clinical situations (Daley et al., 2017). Concept maps also promote reflective thinking in students. Reflective thinking as higher order thinking relates knowledge to prior understanding. Using concept maps, students were able to use self-reflection and analysis and found meanings of their own life experiences while learning theories of adult development (Daley, 2004). Equivocally, reports from the literature have linked concept maps with translation of theoretical nursing knowledge in nursing practice evidenced by enrichment of students' understanding of case studies relevant to patient experiences in clinical settings. To facilitate teaching and learning in clinical settings, concept maps guide nursing students to (a) construct a nursing care plan for patients, (b) enhance learning during postclinical debriefing, (c) promote learning in simulation laboratories, and (d) develop the ability to identify nursing diagnoses, collect clinical data, and design a plan for safe and effective nursing care (Cook, Dover, Dickson, & Colton, 2012; Schuster, 2012). Concept mapping also helps faculty recognize the relationship of educational competencies and student learning outcomes in a nursing program curriculum (McDaniel et al., 2005). Faculty may use concept mapping to assess contents that students must learn for successful progression, as well as to facilitate content sequencing across the curriculum (Franzen & Bannon, 2016; McDaniel et al., 2005). Nursing students are often required to read voluminous complex materials for course reading assignments throughout the curriculum, yet they struggle with retaining and understanding the new content. Concept mapping helps nursing students to understand course readings and retain the new content (Daley, 2010; Daley et al., 2016). Of the above mentioned studies across health professions, only one study from public health was identified that used concept mapping methodology to examine an ACEs-related topic. O'Campo et al. (2017) conducted an exploratory study to understand differences between men and women's conceptualizations of intimate partner violence. Concept mapping allowed the researchers to extract and preserve data regarding the participants' ideas about relationship conflict and abuse associated with intimate partner violence (O'Campo et al., 2017; O'Campo, Smylie, Minh, Omand, & Cyriac, 2015). Concept mapping is a valid teaching strategy that visually organizes and links important ideas to promote learning. Health professions education has used concept mapping to teach students about complex topics with the added benefit of improving students' critical thinking and decision-making skills. Translation of theoretical knowledge into clinical care has been attributed to concept mapping use in nursing and other health professions education. Of the health professions, nursing education has a long history of success with teaching students how to develop concept maps relevant to providing patient care. Nursing and other health professions students may benefit from using concept maps to learn about ACEs and related complex content. Yet, research literature regarding concept mapping of ACEs or related topics is scarce (O'Campo et al., 2017) and an ACEs Curricular Concept map to guide teaching and student learning has not been explored. Our research is unique because we developed a concept map to reflect ACEs and related content across the BSN curriculum to guide teaching and ultimately evaluate learning. The research aims of this study were to (a) identify major concepts, topics, and student learning outcomes related to ACEs content taught in 12 didactic courses across a BSN curriculum; and (b) develop an ACEs Curricular Concept Map to guide teaching in a BSN program. This study used purposive sampling (n = 22) of faculty teaching in courses selected for the ACEs curriculum integration in the BSN program. Purposive sampling is the most commonly used sampling plan for content analysis (Elo et al., 2014). The university institutional review board (IRB) determined that this study did not require IRB approval or review because the study did not meet the Office of Human Subjects Research Protections' definition of human subject research and 45 CFR part 46 did not apply. To integrate ACEs knowledge across the BSN curriculum, we engaged faculty to develop the ACEs Curricular Concept Map (ACECCM). The ACECCM provides a template for curriculum design and development and guides faculty teaching and student learning about ACEs in didactic and clinical settings. To develop concept mapping for the ACEs Curriculum Integration (ACI), members of course faculty were involved in discussion, debates, and identifying and selecting key concepts that help faculty integrate ACEs knowledge in didactic courses. The ACI team provided faculty with ACEs-related videos, literature, and a model for concept mapping. To facilitate faculty discussions either face to face or via e-mail, two open-ended questions were asked: “What are key ACEs related topics covered in the course?” and “What are the student learning outcomes related to the ACEs content?” The ACI team developed, reviewed, modified, and approved the questions for content validity. After a semester-long process, all faculty members (n = 22) responded to the questions and provided insightful feedback and ideas for the ACEs curricular concept mapping. An inductive content analysis approach identified concepts from texts written verbatim by nursing faculty and notes transcribed from faculty discussion meetings. Inductive content analysis is a reliable and comprehensive qualitative research method for investigating problems by using systematic approach for data analysis to identify essential aspects of a written message for making inferences (Assarroudi, Nabavi, Armat, Ebadi, & Vaismoradi, 2018). Nursing research uses content analysis to describe phenomena and make valid inferences from data, leading to new insights and understanding where knowledge is insufficient. The outcome of inductive content analysis is a concept map (Elo & Kyngäs, 2008). The three phases (preparation, organizing, reporting) of content analysis procedures recommended by Elo and Kyngäs (2008) were followed to analyze the contents. During the preparation and organizing phases, manifest coding was used to organize and analyze narrative text responses from faculty to the two questions (as noted earlier) to categorize similar terms of best fit into major and minor themes. Manifest coding is coding for content that is apparent, directly observable, and measurable by counting the number of times data are repeated in text or a sentence (Elo & Kyngäs, 2008). Coding data required team members to self-reflect on how well categories represented the data to detect themes and concepts (Bengtsson, 2016; Elo et al., 2014). The reporting phase describes final analyses and results of the content analysis. Before proceeding to the reporting phase, the ACI team members independently constructed a concept map to include all identified concepts and compared the maps for similarities and differences. During the reporting phase, final concepts and directional statements were identified, recorded, debated, and agreed on among the team, resulting in the ACECCM formation. The ACECCM was shared with faculty for credibility and fittingness. The content analysis revealed the major and minor themes across the courses selected for ACEs integration (Table 1). The themes emerged from the analysis of the class topics and the ACEs-related learning outcomes in each course outlined based on faculty's written responses and notes from faculty discussions. The ACEs Concept Map is displayed in Figure 1. The Concept map is based on identified major and minor themes. Each concept will be discussed in turn (major concepts are italicized). Adverse childhood experiences curricular concept map. Culture of Health and Health Equity are the desired terminal outcomes of the ACECCM. These concepts were chosen because each one represents the overarching goal for good health among all individuals. According to the Robert Wood Johnson Foundation (n.d.), a culture of health is “good health and well-being that flourishes across geographic, demographic, and social sectors; fostering health equitable communities that guide public and private decision making in which everyone has the opportunity to make choices that lead to healthy lifestyles.” Culture of health epitomizes healthy choices and lifestyles in families and communities across generations to improve overall well-being through managing chronic illness, toxic stress, and the social determinants of health (Weil, 2016). Health equity is based on the ethical principle of distributive justice (Braveman & Gruskin, 2003) and is best defined as “everyone has fair and just opportunity to be healthier” (Braveman, Arkin, Orleans, Proctor, & Plough, 2017, p. 1). Health equity is considered the highest level of health attainment for all people and the core element in building a culture of health (American Public Health Association, n.d.). The ACECCM begins with an insult to an individual's health. 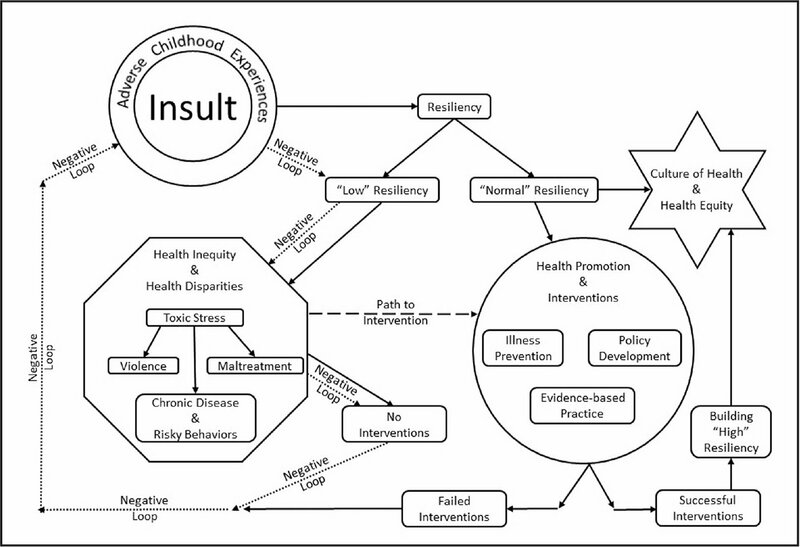 We defined insult as exposure to negative social determinants of health early in life that result in ACEs. Hence, in our concept map, negative social determinants are linked to low resiliency and follow the negative loop. In contrast, positive social determinants are linked with normal or high resiliency and follow a positive pathway to Culture of Health and Health Equity. 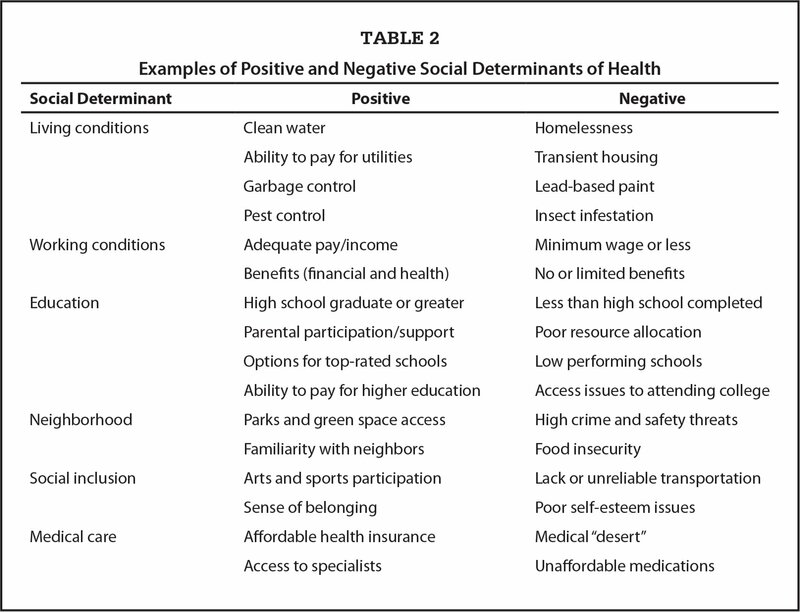 Examples of negative and positive social determinants of health are displayed in Table 2. An individual's response to the insult depends on one's resiliency. resilience is a modifiable risk factor for health in which individuals have assets and capacities to overcome adversity with positive responses to protect their health and build health equity (Bowes & Jaffee, 2013; World Health Organization, 2017). The expectation is that individuals with normal to high resilience may be more likely to achieve a culture of health and health equity. When defining resilience, one must contextualize the meaning according to individual, community, or system (World Health Organization, 2017). The ACECCM focuses on resilience of the individual with community and system interventions to promote health equity and culture of health. Building resilience is primary to supporting a culture of health and promoting health equity through health promotion and illness prevention. Health promotion is the process of enabling people to increase control over and improve their health and is linked to strengthening resilience (World Health Organization, 2017). Supportive environments for health promotion through policy development are instrumental in building resilience. Examples of supportive environments include educational and community resources to improve living conditions, tobacco sales control legislation, bans on advertising unhealthy foods to children, and easy access to affordable healthy foods (World Health Organization, 2017). On the other hand, individuals with low resilience may be more likely to follow the pathway to health inequity and health disparities. Health inequity is a difference in health outcomes that is systematic, avoidable, and unjust (Centers for Disease Control and Prevention, 2014). Health disparity is “a particular type of health difference that is closely linked with social, economic, and/or environmental safety that affect people who have systematically experienced greater obstacles to health” (Office of Disease Prevention and Health Promotion, 2019, para. 5). These obstacles are based on social economic and demographic factors including race, gender, sexual orientation, sexual identity, geographic location and other characteristics linked to exclusion (Office of Disease Prevention and Health Promotion, 2019). The concept map shows three options for resiliency: low, normal, and high. The terms low, normal, and high are adapted from The Brief Resilience Scale (Cronbach's alpha ranging from .80 to .91) that interprets resilience scores as low, normal, and high (Smith et al., 2008). The path from low resiliency leads to health inequity and health disparities composed of toxic stress, violence, maltreatment, chronic disease and risky behaviors, which are consequences that may last a lifetime. There are two options at the health inequity and health disparities juncture: path to no intervention, and path to intervention. The no interventions path leads the individual on a negative loop to potential additional insults contributing to health inequity and health disparities. The individual will continue a vicious cycle on the negative loop until taking the path to intervention. The path to intervention is part of the health professionals' practice to assist individuals in accessing health promotion and interventions. We propose that individuals with normal resiliency may follow one of two paths to culture of health and health equity. Some individuals may advance themselves directly to culture of health. Others follow an indirect route via health promotions and interventions to work with health professionals trained in illness prevention, evidenced-based practice, and policy development. Successful interventions promote building high resiliency in individuals on the path to culture of health and health equity. In contrast, in the event of failed interventions, individuals may follow the path to additional insults via the negative loop. The full impact of failed interventions or no interventions is unknown. On a positive note, we believe that resiliency is one psychological factor that can break the pathway of health inequity and health disparities resulting from ACEs. It is important to note that the social determinants of health are also powerful predictors for health equity and culture of health. Health equity is the insurance of reaching full health potential for all people (López & Gadsden, 2016). Conversely, health equity is weakened when preventable and avoidable social determinants of health hamper life choices of individuals. Social determinants of health are “the conditions in which people are born, grow, live, work and age and these factors are responsible for health inequities” (World Health Organization, 2018, para. 1). More specifically, social determinants of health include socioeconomic status, education, food security, neighborhood and physical environment, employment, social support networks, and access to health care. According to the World Health Organization's (2018) final report on social determinants of health, strong evidences show that health behaviors, social, economic, and physical factors are among the strongest predictors of good health outcomes, health equity, and culture of health globally (López & Gadsden, 2016; National Health Care for the Homeless Council, 2016; World Health Organization, 2008). Health policy, health promotion, and evidence-based practices are core drivers to achievement of health equity and culture of health (World Health Organization, 2018). Therefore, actions to improve health and tackle health inequity must address the social determinants of health and their impact on daily life (Artiga & Hinton, 2018). Finally, health professionals inform and develop health policy, use evidence-based practice, and implement illness prevention and health promotion programs to make a strong impact on improving the culture of health and health equity for all. There are multiple uses for the ACECCM in nursing education. Faculty may use the ACECCM to teach students about the direct and indirect linkages of chronic disease development resulting from toxic stress and ACEs. For example, during the Adult Health Nursing course in the BSN curriculum, students learn through class discussions and case studies about the effects of toxic stress on development of acute coronary syndrome. In the Community Health Nursing Course, students examine the social, ecological, and economic factors contributive to ACEs and identify the role of ACEs related to health disparities and the role of resilience in health equity attainment and illness prevention. Faculty teach students using the ACEs concept map to illustrate evidence-based practices for effective health promotion interventions in the Nursing Research Course. In the Transition to Professional Practice Capstone Course, students learn health policies and the role of advocating, informing, and shaping health policies to mitigate detrimental effects of ACEs among children and families at local, state, and national levels. Integration of ACEs knowledge in nursing education helps prepare graduates to assess patients for ACEs. Early identification of ACEs combined with appropriate interventions can prevent lifelong health consequences in patients exposed to multiple traumatic events (Hornor, 2015). New opportunities exist in clinical practice to build nursing leadership at the point of service delivery for nurses to initiate ACEs screening in collaboration with the health care teams. Nursing faculty may prepare nursing students to lead changes by creation of trauma-informed care systems and taking initiatives to recognize and respond to the effects of traumatic stress on patients and families. In a trauma-informed care system, health providers can help patients build resilience in conjunction with an ACEs screen to inform healing and recovery. The goal for teaching nursing students about ACEs and related concepts is to help them to understand the effects of toxic stress and child maltreatment on adult health and to identify workable health promotion interventions to build resiliency and promote health. As students transition to becoming professional nurses across care settings, they continue developing professional roles through providing quality and safe care for ACEs affected individuals and working with other health care professionals to building a culture of health and improve health equity for all. The ACECCM is based on major and minor themes developed by nursing faculty. Currently, the ACECCM is used in the university BSN program in this study. How students learn ACEs knowledge using the designed concept map is yet to be assessed. Whether the ACECCM can be used in the graduate program needs further efforts. Evaluation studies are needed to measure the effect of using ACEs concepts maps in nursing education and the effects on nursing graduates for their ability to translate ACEs knowledge to nursing practice. This study has several limitations that should be considered when the results are interpreted. The first limitation is that the sample size derived from nursing faculty from one BSN program limits transferability and generalizability (Elo et al., 2014). To improve transferability, additional BSN programs across the United States need to integrate ACEs into their curriculum so a larger study then could explore and compare themes identified to expand the curricular concept map developed in this research. The second limitation is the lengthy time frame of approximately 14 weeks during one semester for faculty responses and discussions. An extended time frame allows faculty to converse with one another about ACEs content taught in their respective courses, which may influence faculty's responses. The third limitation is manifest coding. While manifest coding is a valid approach to content analysis, researcher interpretation of data is a potential limitation to successful analysis (Elo & Kyngäs, 2008). The final limitation was related to data analysis challenges with categorization of themes. Categorizing themes was challenging because some terms could be grouped easily under more than one major theme. To address this issue, we conceptually defined each major theme and used a minor theme to determine the best fit of a particular major theme. Despite these limitations, this study adds to the nursing and health professions education research literature about using inductive content analysis to develop an ACEs concept map across curriculum. Adverse childhood experiences are a growing concern of health professionals worldwide. Yet, a systematic integration of ACEs knowledge in health profession education is limited. Effective and reliable teaching methods are needed to educate future health professionals about ACEs. Concept maps are useful tools for faculty teaching and student learning to promote knowledge attainment, skills development, and critical thinking. The ACECCM was developed based on inductive content analysis of faculty narratives and discussion notes about ACEs and related content taught in 12 courses. Future studies are needed to evaluate the usefulness and effectiveness of the ACECCM in faculty teaching and student learning about ACEs and whether the systematic integration of ACEs across nursing curriculum prepares graduates for ACEs awareness and prevention, toxic stress reduction, creation of a trauma-informed care, building resilience, informing policies, and, ultimately, promoting health equity for all. Akcay, H. (2017). Constructing concept maps to encourage meaningful learning in science classroom. Education, 138, 9–16. Daley, B.J. ( 2004, September. ). Using concept maps in qualitative research. Paper presented at the Conference on Concept Mapping. , Pamplona, Spain. .
Kafi, Y.B. & Resnik, M (Eds.). (1996). Constructionism in practice: Designing, thinking and learning in a digital world. New York, NY: Routledge. López, N. & Gadsden, V.L. (2016). Health inequities, social determinants and intersectionality. In Bogard, K., Murry, V.M. & Alexander, C. (Eds. ), Perspectives on health equity and social determinants of health (pp. 9–30). Washington, DC: National Academy of Medicine. Nirmala, T. & Shakuntala, B.S. (2011). Concept mapping: An effective tool to promote critical thinking skills among nurses. Nitte University Journal of Health Science, 1(4), 21–26. Novak, J.D. (2006). The development of the concept mapping tool and the evolution of a new model for education: Implications for mathematics education. Focus on Learning Problems in Mathematics, 28, 3–32. Novak, J.D. (2013). Empowering learners and educators. Journal for Educators, Teachers and Trainers, 4, 14–24. Schuster, P.M. (2012). Concept mapping: A critical-thinking approach to care planning (3rd ed.). Philadelphia, PA: F.A. Davis. Wei, W. & Yue, K.B. (2017). Integrating concept mapping into information systems education for meaningful learning and assessment. Information Systems Education Journal, 15(6), 4–16. World Health Organization. (2008). Closing the gap in a generation: Health equity through action on the social determinants of health. Geneva, Switzerland: Author. Dr. Gill is Assistant Professor, Dr. Zhan is Dean and Professor, Dr. Rosenberg is Assistant Professor, and Dr. Breckenridge is Clinical Associate Professor, Loewenberg College of Nursing, University of Memphis, Memphis, Tennessee. The authors thank the Urban Child Institute for funding this project. They also thank the faculty at the Loewenberg College of Nursing for their involvement with the development of the ACEs Curricular Concept Map. Address correspondence to Marie E. Gill, PhD, MS, RN, Assistant Professor, Loewenberg College of Nursing, University of Memphis, 4055 N. Park Loop, CHB #3560, Memphis, TN 38152-3740; e-mail: mgill@memphis.edu.